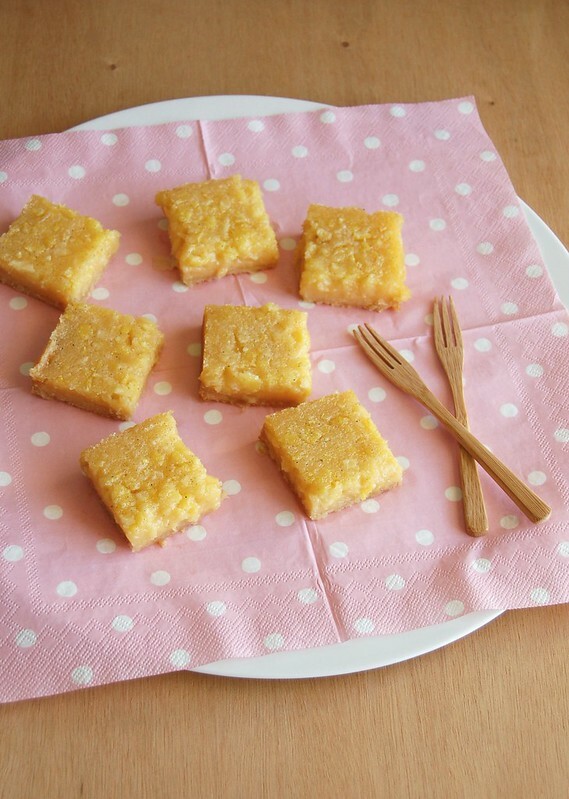 While going through the links saved on my Delicious last week searching for much needed inspiration, I saw these lemon bars I’d seen weeks before – even though they’re probably my favorite baked good, lemon bars are nothing new to me, I have made them in several different ways so far. These, however, got me really curious because the whole lemon – zest, pulp, white pith and all – gets chopped and macerated in sugar before being blitzed into a sort of jam. The thought of it made me pucker up and my mouth was watering like crazy, not to mention that this unusual technique perfectly suits the letter “e” on my recipe search list. And it’s lemon - I had to make it. I found these bars delicious, insanely sour with little bits of lemon here and there making the texture a very interesting mix of smooth and chewy. They might be too much if you’re not into citrus and sour flavors like me, though – it’s a matter of taste. I am sure that some people will think that Alejandro González Iñárritu has lost his marbles after watching the teaser trailer for Birdman, but I personally found it beautiful beyond words and cannot wait to watch the whole movie. Preheat the oven to 180°C/350°F. Lightly butter a 20cm (8in) square baking pan, line it with foil leaving an overhang in two opposite sides and butter the foil as well. Filling: quarter one lemon lengthwise then slice each quarter into fairly small pieces, removing any seeds. Mix the lemon pieces with the sugar in a small bowl, rubbing the sugar into the lemon with your hands to help extract the lemon oil. Set aside for an hour at room temperature. Base: in a medium bowl combine the flour, sugar, salt, melted butter and vanilla until a dough forms. Press it onto the base of the prepared pan and bake for 22-25 minutes or until golden. While the base is cooking, finish preparing the lemon filling: juice the remaining lemon and measure out 3 tablespoons of juice; set aside. Using a food processor, blitz the macerated lemon-sugar mixture until smooth. Add the lemon juice, along with the eggs, vanilla, corn starch, salt and the melted butter. Purée again until the mixture is smooth. Once the base is cooked, remove the pan from the oven and reduce the temperature to 150°C/300°F. Gently pour the lemon filling over the cooked crust and return the pan to the oven. Bake for about 20 minutes or until the mixture is barely set. The mixture will puff slightly in the middle and jiggle when you gently shake the pan. Remove from the oven and allow to cool completely in the pan (refrigerating it for 1 hour makes cutting easier). Using the foil, lift from the pan and cut into squares. I've made a whole lemon cake before and loved the results, so I need to try these! I just love love love lemony sweets :) these bars look great!